Marc Rich, one of the most influential and controversial commodity traders that ever lived, once referred to oil as the blood that flows through the veins of the world. 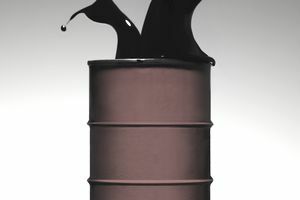 Crude oil is an energy staple for most of the inhabitants of planet earth. Besides being one of the most actively traded commodities, the price of crude oil is extremely sensitive to geopolitical events. When it comes to physical oil, there are different grades The most popular traded grades are Brent North Sea Crude (commonly known as Brent Crude) and West Texas Intermediate (commonly known as WTI). Brent refers to oil that is produced in the Brent oil fields and other sites in the North Sea. Its oil price is the benchmark for African, European, and Middle Eastern crude. The pricing mechanism for Brent dictates the value for roughly two-thirds of the world's crude oil production. Brent is what those in the industry refer to as "sweet" crude. That means it has sulfur content below 5 percent. Brent's sulfur content is 0.37 percent. The lower the sulfur content the easier and cheaper it is to refine into various products like gasoline. WTI, the other major traded crude oil, is the benchmark crude for North America. WTI is actually sweeter than Brent Crude and has a sulfur content of around 0.24 percent. WTI is a better grade of crude oil for the production of gasoline while Brent oil favors the production of diesel fuels. The NYMEX (New York Mercantile Exchange) division of the CME (Chicago Mercantile Exchange) lists futures contracts of WTI crude oil. Delivery for WTI crude futures occurs in Cushing, Oklahoma. Brent crude oil futures trade on the Intercontinental Exchange (ICE). Asian countries tend to use a mixture of Brent and WTI benchmark prices to value their crude oil. Crude oil costs approximately $3 to $4 per barrel to ship from Europe to the United States on supertankers. There are differences in the costs of storing crude oil in European and North American trading hubs. In a normal market, the price difference between Brent and WTI hovers around a $2.50 to $4.00 premium for WTI versus Brent. This is due to the lower sulfur content of WTI. However, there are times when this differential favors a premium for Brent. These circumstances often occur for political reasons. To understand how world events can cause the spread between Brent and WTI to move dramatically for long periods it's best to go back in time. At the start of 2011, the Brent-WTI spread was close to flat. The spread widened during 2011 with Brent trading at a premium to WTI. Around the time that the Arab Spring got underway in Egypt in February of 2011, the spread widened. Fears of a closure of the Suez Canal and a lack of available supply caused Brent crude oil to become more expensive than WTI. As tensions eased so did the spread. Then in late 2011, the Iranian government threatened to close the Straits of Hormuz through which 20 percent of the world's oil flows each day. Once again, the spread widened this time with Brent trading to over a $25 premium per barrel to WTI. Brent and WTI crude have different properties (i.e., WTI has lower sulfur content). Therefore, the price differential is a quality spread. Also, the two crudes are located in different parts of the world, Brent in Europe and WTI in North America. Therefore, Brent versus WTI is also a location spread. The nominal price of crude oil is just one factor involved in understanding the crude oil market. The spread between Brent and WTI is a perfect example of how quality and location spreads affect the structure and ultimate pricing of crude oil around the globe. There can be seismic shifts in world events that affect pricing changes such as the premium for Brent dropping (which it did in 2015). That premium drop occurred for two major reasons. First, an agreement that Iran will increase the amount of Iranian crude flowing into the market on a daily basis. Since Brent is the pricing benchmark for Iranian crude, this depresses the price of Brent relative to WTI. The other reason is that U.S. rig counts dropped at about that time. And, with expanding support for exporting U.S. crude abroad, that means less drilling in the future and less U.S. production on a daily basis. Therefore, Brent moves lower by virtue of more Iranian crude and WTI strengthens because of less U.S. production and increasing exports. This relationship is one of the key components in understanding the fundamentals of the world crude oil market. What Makes Oil Prices So High?